How to Export: Ontario Export Education Sessions | Mentor Works Ltd. The Government of Ontario provides frequent export training sessions across Ontario which business leaders may attend to enhance their understanding of exporting and the related legal and economic processes. These sessions provide hands-on, intensive approach to developing and implementing an export plan. They aim to make businesses more knowledgeable about exporting and are a great first step for companies starting to export or expanding exports to new markets. During this half-day seminar, business leaders will learn what it takes to become a successful exporter. This session also provides an overview of the key export support resources and partners that can help you get ready to go global. Location: Travels to various municipalities across Ontario. This one or two-day interactive workshop guides business leaders through the complete export process. Sessions are delivered by Ontario export advisors who give new exporters practical one-on-one exporting advice. The AIM program can help you get your business started on the path to successfully exporting internationally. The New Exporters to Border States program is a practical, hands-on introduction to United States exporting basics. Sessions include presentations from industry experts providing information on topics such as U.S. immigration and business visa requirements, federal and state tax liability issues, currency exchange strategies, corporate and legal considerations, and U.S. customs clearance documentation requirements. Location: Bi-annual sessions held in Buffalo, New York. Once companies have developed a strategy for export expansion, a logical next step is to look for export grants which reduce the cost and risk of market development projects. Both the federal and provincial governments offer funding programs to support the development of international markets; this is a valuable opportunity to leverage government grants. 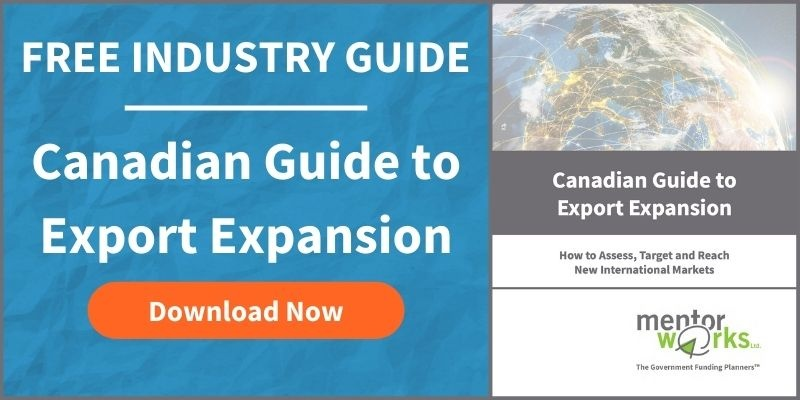 Discover more exporting resources and learn about government funding programs to reduce the costs of export expansion by checking out this Canadian Business Guide to Exporting.